I wanted to make a dessert that looked as good as it tasted, and in spotting some gorgeous Comice pears in Waitrose, I thought I'd take a stab at poaching them. To add a little more luxury, I coated them in chocolate at the end which made them look very posh indeed. Luckily, they certainly do taste as good as they look. They are also quite easy to make and can be prepared in advance of any special occasions, which makes always the event itself that little bit less stressful. Preheat your oven to 180°C. Put the lemon juice in a bowl, then peel the pears and remove the core at the bottom. Coat each pear in lemon juice to prevent discolouration. Place the pears upright in a small roasting tin, then mix the lemon juice with the honey and spoon over the pears then pour the sweet wine into the tin. Cook the pears in the oven for 30 minutes, basting every 10 minutes or so. They should be soft but shape intact when you remove them from the oven. Reserve the juices from the baking tin and transfer the pears onto a chopping board covered with baking paper. Leave to cool for an hour or so. 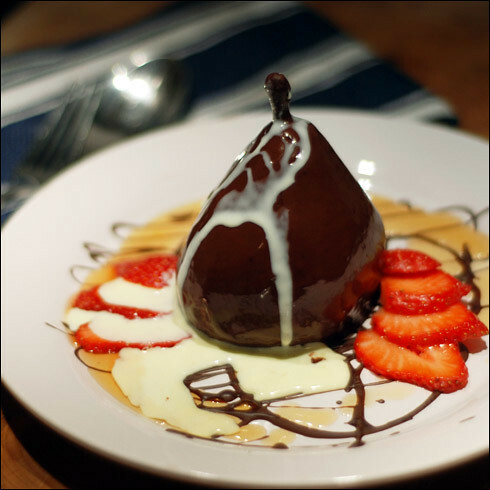 Once the pears are cool, melt the chocolate either in the microwave or in a bowl placed in a shallow pan of water, then spoon the melted chocolate over the pears to coat them. I drizzled a little chocolate on each individual serving plate too to add decoration. Those of you who are more creative than me may well be able to create a masterpiece in drizzled chocolate here! Transfer the chocolate coated pears to the plates and when ready to serve, pour a little of the juice you reserved earlier onto the plates. Serve with a little cream or scoop of icecream and a glass of sweet white wine. You are guaranteed to impress!